So can you only take sealed water bottles in? What about containers like Clean Canteens? I see them around the park. Are people just filling them up at water fountains? They have to be empty and if you ask nicely the concession people I'll give you ice, assuming the cooling rooms aren't available. The bar at the Red Porch has water coolers dispensing water during these hot games. A good place to fill up. The rule is sealed water bottles, but enforcement is mixed. I've never done it, but stick a water bottle in your pocket. Long as you don't have a short shirt, they never check. I'm addicted to pineapple juice, always thought about putting it in a water bottle and doing that. You can put anything in your pockets and bring it in, they never check. I've actually never have had a problem with water bottles they inspect. I have been sure to bring clear or semi clear cycling water bottles either empty or filled with ice water. I just tell them it has water inside and they let me through. Worst that could happen is I just dump the contents in the trash and being an empty bottle in. Never tried bringing opaque bottles in. If anyone wants to borrow some of my old super-fat-days shorts they have giant pockets that the secuirty people never check (unless the Phillies are in town). They're a size 62 though, bring a belt. Bring a belt? Or a friend to jump in there with you! About as much time as it would take to drive to the park and back. You might want to check out the Ballpark bus. Thanks math guy. 47 min. not too bad! ...the one small mercy is that since it's a mid-week match at least they shouldn't have any major track-work going on at the time (I emphasise SHOULDN'T - they haven't posted anything on the site, and the Orange line is a prime location for this with that Silver line project going in between East and West Falls Church). Service shouldn't be too bad going in since trains will be running on a rush hour schedule (though the last weekinight game I attended against the Rays, I waited at L'Enfant Plaza and watched FOUR yellow line trains go by before a lone green line, which was already crammed to the gills). It sounds like you'll be okay boarding at Vienna around 3:00. With Metro though, be prepared for anything. Going back to that last game I went to, I got on at West Falls Church around 4:30-4:45. There was an out-of-service train parked on the platform, preventing inbound trains from entering the station. After about 15 minutes, someone must have found the keys, so they moved it out of the way and into the pocket track there. Two stops into the ride, the train broke down, so we had to offload and then cram onto the next train. Now that the crowds are bigger, you really ought to consider walking to Cap South if you are catching the Orange. If you are with kids who can move along or adults who don't mind a walk, it is pretty easy, you can get a seat, and you don't get the sardine effect on the platform. With Metro prices it costs less to park than to take a family round trip on the train. Rush hour getting to the park is hell but getting home from the game at 10:30 instead of 11:30 is real nice. we will have the day pass at $9/ea = $27 total. round trip regualr would be $30 for the 3 of us, which is cheaper than parking, but we had planeed on the day pass anyways to get around and to the game. thansk for advice though. The day pass goes up to $14 on July 1: http://www.wmata.com/rider_tools/metro_service_status/advisories.cfm?AID=1086. The big difference is that they will be valid at all times; previously, with the $9 pass, they were not valid before 9:30 a.m. weekdays. How's that? 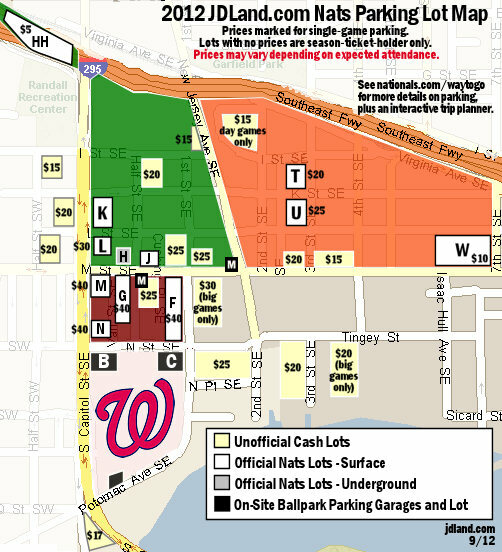 Parking at the lot right across the street is only $25 and there are cheaper lots if you are willing to walk a few blocks. we are already getting the day pass anyways. Another idea from Alexandria or Crystal City is take the Yellow Line past L'Fant Plaza and get off at Archives. Then catch the Green Line to the ballpark. Archives is much easier and less crowded than at L'Fant Plaza. Convenient how Bus and rail prices go up BEFORE July 4th!